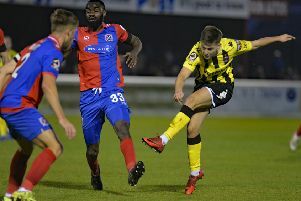 AFC Fylde boss Dave Challinor was in a disappointed mood after his side’s National League campaign came to an end in the first round of the play-offs. The Coasters’ hopes of progressing into the Football League were ended with a 2-1 play-off defeat at Boreham Wood, who will head to Sutton United for Sunday’s semi-final. Fylde paid the price for an opening 20-minute spell which saw the home side two goals to the good courtesy of Jamie Turley and Bruno Andrade. Simon Grand pulled a goal back for Challinor’s men, who were unable to force an equaliser. “There is obviously an overriding feeling of disappointment because our season has ended,” Challinor said. “I truly believe that you get what you deserve over the course of a season and that was the case tonight. We weren’t good enough. “Moments like this only make me more desperate for success. “I have been on both sides of this feeling and I think it’s important to remember the lows as well as the highs. “I can’t fault the players for effort. The big disappointment for me is that our season has been defined by situations within our control. “We lost the game by conceding two ridiculously poor goals.